Chock & Bates impress. Davis & White get inflated. 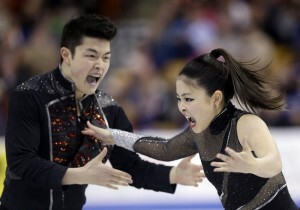 The Shibutanis look at the skaters in the mirror. Hubbell & Donohue may be onto something. Gracie Gold gets pushed. Polina Edmunds arms herself. Mirai Nagasu breaks it up. Ashley Wagner uses both feet. Agnes Zawadzki has a tough time, and Rachael Flatt shows up. you can find the Ice Queens on Facebook, Twitter, and Tumblr, you can email us, and you can buy some of our great merch at Cafe Press. This entry was posted in Podcast and tagged Agnes Zawadzki, Ashley Wagner, Chock & Bates, Davis & White, figure skating, Gracie Gold, Hubbell & Donohue, Johnny Weir, Mirai Nagasu, NBC, NBC Sports, Olympics, Polina Edmunds, Rachael Flatt, Scott Hamilton, Shibutani, Tara Lipinski on 2014-01-19 by epicdeer.